Take a moment to think about your pets' microchip - the tiny chip that sits between their shoulder blades and contains vital information. Is it 100% up to date? Have you had an address change since it was implanted? It’s easy to forget to update a microchip as time goes by, but it can be the key to recovering a family friend. Every 2 seconds, a pet goes missing in the U.S.
Let’s take a closer look at how microchips work and how to keep them updated. After your pet is first microchipped, the next step is to ensure your pet’s vital information was entered correctly. Occasionally mistakes are made, and an incorrect phone number could be a huge problem in an emergency situation. Check the pet microchip registry on your own or work with your vet’s office to double-check. The chip itself just contains a unique ID number, but that can be connected to a wide range of information, including your pet’s basic health history, preferred vet clinic, and your personal phone number, email address, and street address. What if you discover an error or old information? That means it’s time to ask for help updating the microchip. If you found the problem online or by calling the microchip manufacturer, you may be able to request a change that way. But the easiest option is probably stopping by to see the vet. Veterinary offices are equipped with special devices that can scan microchips and tell you exactly what they show. It’s also the perfect opportunity to update any vaccinations or medications that are beneficial to your pet’s health. All the fresh information will be stored on the microchip, so it’s accurate next time the chip is read. Here are a few more things to know about how microchips work. Q: What happens if my pet gets lost? A: A veterinary office or animal shelter will scan the microchip, reach out to the pet recovery database, and someone will contact you. It’s a scary situation, but people often recover lost pets within a few hours using microchip scans. Q: Does a microchip track my pet? A: No, a microchip doesn’t include GPS or any other technology that tracks your pet’s location on an ongoing basis. It simply uses RFID, or radio-frequency identification, to send a beam of information to the scanner that’s held over your pet’s back. Q: What kinds of pets can be microchipped? A: Dogs are most common, but cats should be microchipped too - it results in 20 times more recoveries of lost pets. It’s possible to microchip other kinds of animals, like ferrets, parrots, and pigs, but you should always check with a veterinarian to be sure. Q: Is microchipping or scanning painful? A: Placing the chip is about as painful as a vaccination for your pet, and scanning the chip is pain-free. When your pet is microchipped and the information is kept up to date, it goes a long way toward protecting your beloved pal. 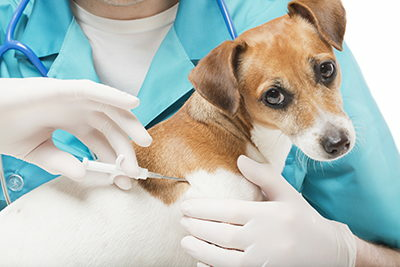 For more information about microchipping, connect with the experts at Academy Animal Hospital.